Banks like Barclays and HSBC are the latest planning to use the technical idea behind bitcoin for their own digital currency. The world’s biggest banks aren’t immune from cryptocurrency euphoria, with a range of projects underway to explore how traditional financial firms can benefit from the innovation. Swiss banking giant UBS and 10 other companies say that they plan to use the technical idea behind bitcoin—a distributed ledger called a blockchain—for their own digital currency (paywall). This could show the way for the world’s biggest central banks to do the same. Banks like Barclays and HSBC are the latest to join the “utility settlement coin” project, started by UBS and Clearmatics Technologies in 2015. The idea is to develop a new, streamlined payment mechanism for institutional purposes. According to CoinDesk, it could potentially replace clearinghouses and other back-office plumbing that sits between buyers and sellers of assets. Alex Batlin, who heads BNY Mellon’s blockchain projects, led work on utility settlement coin at UBS at its inception. For him, it’s an example of blockchain technology’s promise to remake finance. “Blockchain is a really good, resilient system,” he said in an interview earlier this summer. “The interesting thing about bitcoin is since its inception, no one’s cracked it. Yet it’s completely in the open.” BNY Mellon is also involved in the utility settlement coin project. The hope is that the UBS group will come up with something faster, cheaper, and more reliable than existing systems. Each settlement coin would represent fiat currency like euros and dollars on a one-to-one basis, and would thus be 100% backed by collateral at the domestic central bank, according to UBS. The idea is that exchanging the digital currency as payment for assets will be a more efficient means of exchange. Because the digital coins will be backed by cash at a central bank, which cannot default (they can always print money if they have to), the crypto tokens are free from credit risk. UBS says transfers and ownership could be settled instantly—the promise of blockchain technology. There are still questions, like whether the technology could handle the volume necessary for the scale of institutional markets run by big banks. Central banks from Beijing to Washington have a similar idea, and are investigating whether they can issue their own digital currencies. While bitcoin was developed to disintermediate such centralized monetary authorities, the Bank of England believes it could use the technical ideas behind it to impose more control over its currency and provide new ways to stimulate the economy. 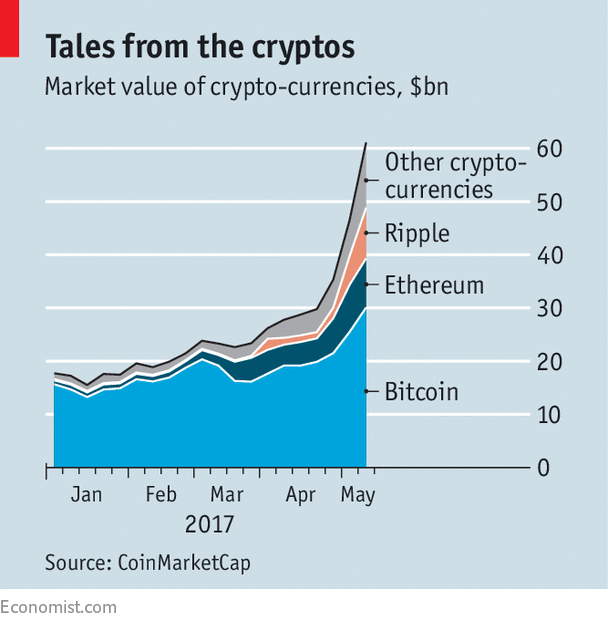 Far from making mainstream finance obsolete, right now blockchain and cryptoassets appear to be one of the industry’s preferred new inventions. The Bank of England published research last year (pdf) suggesting that a digital currency issued by a central bank could bolster financial stability, boost economic growth, and generally make monetary policy more efficient. A model for this is emerging in the private sector: The project involving UBS and other financial firms is far from complete—a limited launch could take place at the end of next year—but the momentum behind it suggests that cryptocurrencies are entering the mainstream.